Mo’s Low Cost Liquors and Bar, a troubled business at the Main-Weiss intersection, will be closed for 60 days, mayor Andre Sayegh announced on Wednesday morning. Sayegh said closure starts on Monday, Oct. 15. “They must make every effort to be a good neighbor in a good neighborhood. We want to let them know we are a city of laws and they must abide by the law,” said Sayegh at a press conference in front of the business. 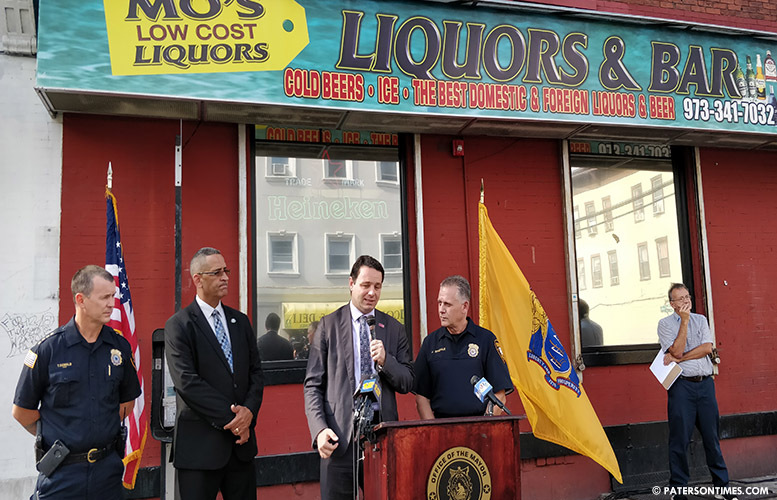 Sayegh said the liquor business has to connect its three cameras to the “Eyes on Paterson” system which will allow police to monitor the area. “We went to Trenton to fight for the community,” said Speziale. He said this is the first time the city went to Trenton to battle a liquor store. Mo’s Low Cost Liquors and Bar was given a 200-day suspension by the municipal liquor board. But, the business appealed the suspension with the state, arguing it was too onerous and complained about political interference. There was no political interference, said municipal officials. The interference cited by the bar’s lawyer, Theresa Richardson, was councilman Luis Velez speaking against the business at the municipal liquor board meeting. Velez urged the board to issue maximum penalty against the business for depriving residents of sleep. Velez and Sayegh were approached by parents and elementary school students in front of a reporter complaining about hearing gunshots and the gangs that have taken over their neighborhood earlier in the year. At the time, mayor-elect Sayegh and Velez promised to take steps to address the situation. Richardson did not respond to a call for comment on Wednesday morning. “This is about the families — the moms and dads, the children that live here — so they can rest at ease,” said police chief Troy Oswald. The liquor business’ owner has to meet with police on a monthly basis to ensure compliance with the settlement, said Speziale. A violation of the settlement will lead to a reversion to the 200-day suspension, he said. A dozen neighborhood residents watched as the mayor made his announcement. “Thank you!” shouted Brunilda Mercado, who lives steps away from the business. She said the imposition of the business curfew, forcing the bar, which had dozens of young men playing dice and dealing drugs outside at all hours, close at midnight has helped to quiet the area. “It’s been better,” said Mercado.